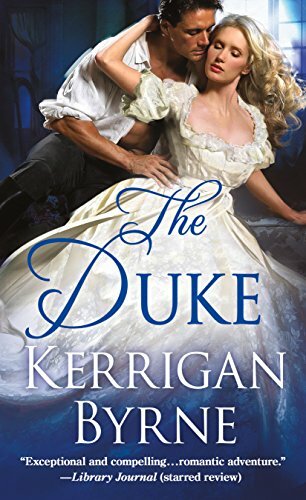 Kerrigan Byrne’s fourth Victorian romance is my favorite so far (yes, even more so than The Highwayman, reviewed here). THE PLOT: By day, Imogen Pritchard is a nurse struggling to support her mother and younger sister. By night, she becomes Ginny, a barmaid working to pay off her dead father’s gambling debts. Imogen refuses to prostitute herself like the other barmaids until the night a young duke stops in the tavern on the way to his family’s estate. Cole Talmage, a younger son, never wanted to be the duke, but now he’s all that’s left of his family. When the duke shows interest in Ginny, her boss insists she spend the night with him (convincing her by threatening her young sister). Their subsequent encounter leaves a lasting effect on both of them. Fast forward to three years later. Cole and Imogen have had one additional encounter when Cole, a spy, was brought home from enemy territory with one hand cut off. Imogen was his nurse at the hospital, but between “Ginny’s” wig and makeup and his own fevered delirium, he didn’t recognize her. Now, though, Cole is obsessed with finding Ginny while crossing verbal swords with his neighbor, a widowed countess. The countess (also Imogen) is running a social rehabilitation program out of her mansion that sets Cole’s teeth on edge. He can’t convince the exasperatingly independent woman how dangerous her plans are…until it becomes apparent that a serial killer’s attacks have all revolved around her. MY TWO CENTS: My summary may sound pretty convoluted, but the twists and turns are what made this book so very enjoyable to me. Plus I love that dramatic irony…the reader knows the whole time exactly where “Ginny” is, and Cole turns himself inside out trying to find her, all the while falling in love with her alter ego. Whom he dislikes intensely. But doesn’t really. I really rooted for Imogen. You’ve got to hand it to her; she gets out of one scrape after another. Sometimes it’s through her own intelligence and willpower, and sometimes it’s because she’s shown kindness to people who then help her when she needs it. All of the couples from the previous three books play strong supporting roles. We also get a bit more on Morely, whose book is coming next (see below). COVER NOTES: Very nice color scheme, otherwise matching up fairly well with the other books in this series. I like how the pose completely hides his left hand, making sure there’s no inconsistency with the story. NEXT UP IN SERIES (UPDATE/CORRECTION): The next book, releasing in October, will be The Scot Beds His Wife, about Gavin St. James from The Highlander. Hopefully we will see Inspector Morley’s book, The Rogue Takes a Wife, after that.